The Station Hotel in the mid 1980s – do you remember a talking clock here? A cracking image kindly supplied by Mike Leonard. 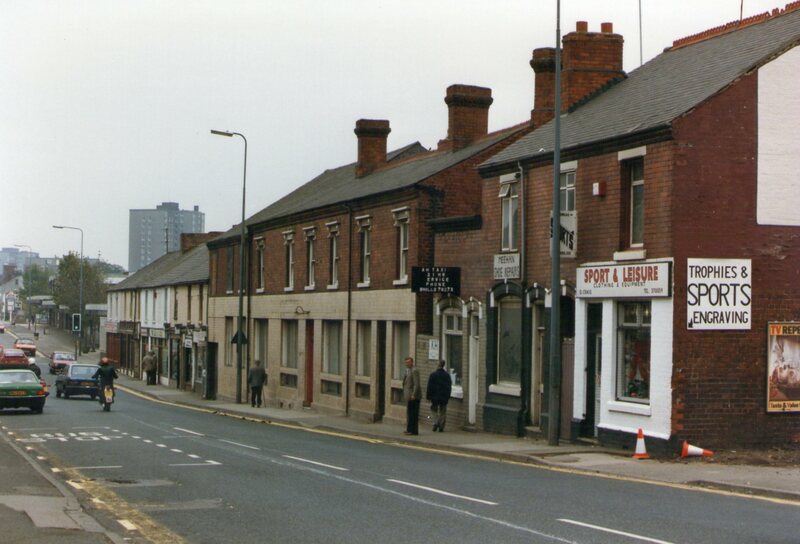 I’ve had an interesting enquiry come in from reader Bee who’s asked something that has very much intrigued me – do you remember the ‘speaking clock’ next to the Station Hotel, Brownhills? For those too young to remember, the Station Hotel stood where Aldi is today, and closed in 1985, and was finally demolished by 1990. It was once a classy establishment and seat of the William Roberts pub and brewing empire, but in the postwar years had the reputation for being a lively, fun boozer with music and great locals. I’m trying to help an old aunt wth dementia and I am looking for some things to help bring back some memories for her. Now, I’ve never heard of this before so I’d be interested to see what others remember – please do get in touch it you know anything. You can comment here, mail me on BrownhillsBob at Googlemail dot com or give me a shout on social media. Thanks to Bee for a fascinating question, and I’m hoping perhaps the below memories of the Station Hotel by Roy Blakey and Val Ainsworth which I featured here a year ago might serve to prompt further memories? I was contacted separately last week by Roy Blakey and Val Ainsworth, who sent me a lovely warm and gentle memory of discovering the Station Hotel whilst exploring by bus in the postwar period, originally posted by Roy to the wonderful Birmingham History Forum in 2015. This is interesting in itself, as to this day, many a Brownhills youth explores Birmingham the same way – similarly restricted by the end of service at 11pm. I came across a note that my husband had put as a post on one of the local history forums. It relates to one of his experiences as a young man. This is a wonderful thing, and thanks to Val and Roy for sharing it – and Brownhills people haven’t changed! If you have any memories to add, please do: comment here or mail me: BrownhillsBob at Googlemail dot com. Cheers. As a group of young men, living in Kingstanding, we spotted that a relatively new bus service had been introduced, taking passengers between the Kingstanding Circle and Brownhills. Having explored many other areas in and around Brum, we decided one evening to have a ride out to Brownhills, an area that we hadn’t had a look at as yet. Having caught the bus ( from just in front of the Snooker hall on the Kingstanding Circle ) we eventually arrived in Brownhills. We had a quick wander up and down the High Street to get our first impressions. We then spotted the Station Hotel pub and decided to pop in for a pint. Brownhills at this time was predominately a coal mining community. The Station Hotel pub was fairly packed as we entered, with what I guess now were quite a few of the miners, some with their wives, some with their girlfriends. The first thing that struck our little group was how friendly the locals were. In the pub we quickly got into conversation with all around us. Completely friendly and pleasant. The second thing that surprised us somewhat was the way the way the young ladies there were quite happy to go up to the bar and confidently buy pints for themselves and then drink them down like experienced troopers. The third thing that happened was that this was the first time we had come full on with some of the lovely Black Country accent. It was a bit surprising I guess, because we had only travelled just over 8 miles from Kingstanding to get there. We had a great couple of hours or so with these lovely people. I think we had to leave sometime before closing time because the last return bus was around 10:00pm. Needless to say, we made that trip a few times at later dates. Always had a soft spot for our Brownhiils neighbours following that period. This entry was posted in Brownhills stuff, Environment, Followups, Fun stuff to see and do, Interesting photos, Local History, Local media, News, planning, Reader enquiries, Shared media, Shared memories, Spotted whilst browsing the web, Walsall community and tagged 1980's, Brownhills, Brownhills local history, Derelict, Events, island, Local History, Mike Leonard, miner, New Photos, planning, Pubs, Redevelopment, Roy Blakey, Silly, Station Hotel, Things to do, Val Ainsworth. Bookmark the permalink. 2 Responses to Do you remember the Station Hotel talking clock?